In case you somehow missed it, we’ve officially launched our latest project, “Drawing On The Past”. I produced a special bag with my friends at Herschel Supply and we’re releasing it as part of an art project open to anyone! This drawing above is from Zach Tutor, the talented guy behind Supersonic Art. 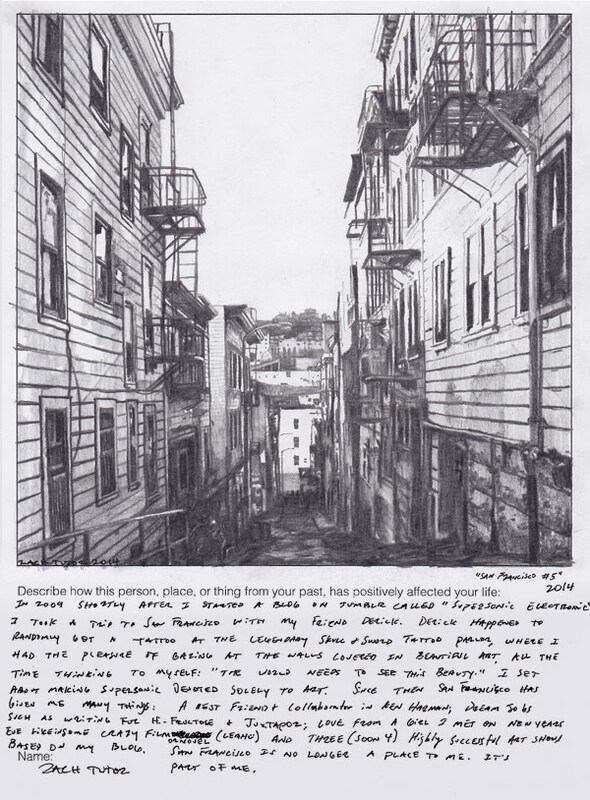 The person, place, or thing that’s positively affected his life is the city of San Francisco. Not only was it the catalyst for starting his blog in the first place, it gave him a best friend, and a girl friend! So what is it for you? I wanna know who or what has helped shape who you are today. If you’d like to submit a drawing to this project, I’d love that! We’ll be giving away some Herschel products to people who submit and three of our favourite submissions will receieve the very limited Herschel Supply x Booooooom bag.